Is the brain a machine? 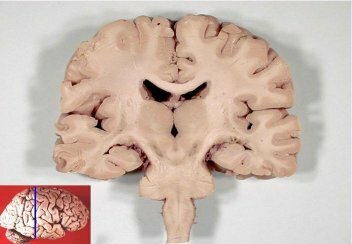 The human brain (above left) has about 100 billion brain cells. A neuron can fire about once every 5 milliseconds. Each neuron connects to 1000 other neurons- so every time a neuron fires, about 1000 other neurons get information about that firing. If we multiply all this out we get 100 billion neurons X 200 firings per second X 1000 connections per firing = 20 million billion calculations per second. 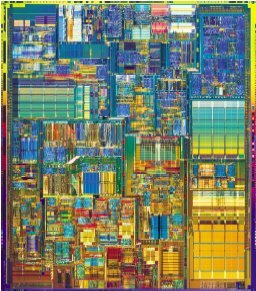 The Intel Pentium 4 (above right) was introduced as the first CPU with a clock rate of 3 GHz (three billion cycles/second corresponding to ~0.3 nano-seconds per cycle). Computers perform calculations, brains perform pattern recognition. When a computer is asked to perform pattern recognition it does so by calulating the smallest "vector distance" between the given pattern and each member in a list of candidate patterns. A computer is not as good as a brain for this purpose. Optical character recognition is particularly poor which is why email addresses are often displayed as images of hand-written text so as to fool spamming software. A brain can read the address, a computer cannot. Likewise, after 40 years of research, speech recognition has not really improved a great deal. When a brain is asked to perform a calculation, e.g. "What is 2 X 3? ", it does so using pattern recognition - it recognizes the symbols "2" , "X" and "3" then recalls a remembered pattern called a multiplication table, selects the "2 X 3" pattern from the table and returns "6". This is a very slow and unreliable process compared with a computer calculation. A stored-program digital computer is one that keeps its programmed instructions, as well as its data, in read-write, random-access memory (RAM). This is known as the von Neumann Architecture. A data address, comprising an address "word" of zeros and ones, is placed by the central processing unit (CPU) onto the address bus. The cell in RAM with that specific address then places its contents on the data bus which and the contents are copied into a register in the arithmetic processing unit (APU). The process is the repeated for a second RAM address and a second register in the APU. The CPU then tells the APU what to do with the contents of the two registers (e.g. add, multiply, etc) and the answer is copied to a third cell in RAM via the data bus. All digital computers operate serially in this way. They only do one thing at a time: fetch, fetch, operate, put. Program instructions telling the CPU what to do are themselves read from RAM in the same manner as the data. All data and instructions have to go through a bus one after another. This has been termed the von Neumann Bottleneck. A brain is certainly not a serial device with von Neumann Architecture. It is a parallel device. Millions of neural circuits operate simultaneously and in parallel. A computer CPU chip is a deterministic device. When asked to peform a given task the computer will always give the same answer (unless specifically programmed to do otherwise, e.g. via the generation of pseudo-random numbers). This is so because, as with all engineered mechanisms, it is designed to do so. It is certainly possible for a non-deterministic event to occur in an electronic device. One such event is known as a "race condition". A good deal of trouble is taken by engineers to ensure that race conditions can never occur in electronic circuits. Neural systems are stochastice. Synapses fire at random intervals. The condition of the synapse only determines the probability of firing. Thus the distinction between a brain and a computer is yet another example of the Deterministic-Stochastic Dichotomy. The brain is a natural mechanism which is fundamentally stochastic. A computer is an engineered mechanism which is fundamentally deterministic. Imagine a brain trying to solve a problem, e.g. a new object or situation has been sensed. Hundreds, thousands, perhaps millions of neural pattern recognizers swing into action: "Where have I seen this colour before? ", "Have I seen this shape before? ", "Is it one shape or a collection of shapes? ","Can I recognise any sub-shapes? ","Does it smell? ","Does it look edible? ","Has it got teeth?". Let us assume that each of these pattern recognizers returns some sort of "vector distance" measure which is somehow represented physically in the brain. All of these distances from each of millions of neural circuits are present in the brain simultaneously. The situation resembles the air gap resistances between cosmic ray tracks in the previous article. As in that scenario, the distance measures are continually changing while the search is going on as different possibilities are being simultanously tested by a multiplicity of neuronal circuits. Then, suddenly, a path occurs in the brain over which the sum of distance measures is less than some critical threshold. The brain "arcs over". We experience a "flash of insight" or gestalt. Note that the stochastic mechanism of perception, tentatively proposed here differs fundamentally from artificial intelligence which involves deterministic processing.